Spot the Communicators? What Year? Click on image to enlarge. POEW Martin Evans in the middle by the table. With careful deduction the photo would have been taken between 1976 and 1980 due to khaki dress still being worn. Also Marty was a Killick on Otago in 1976. 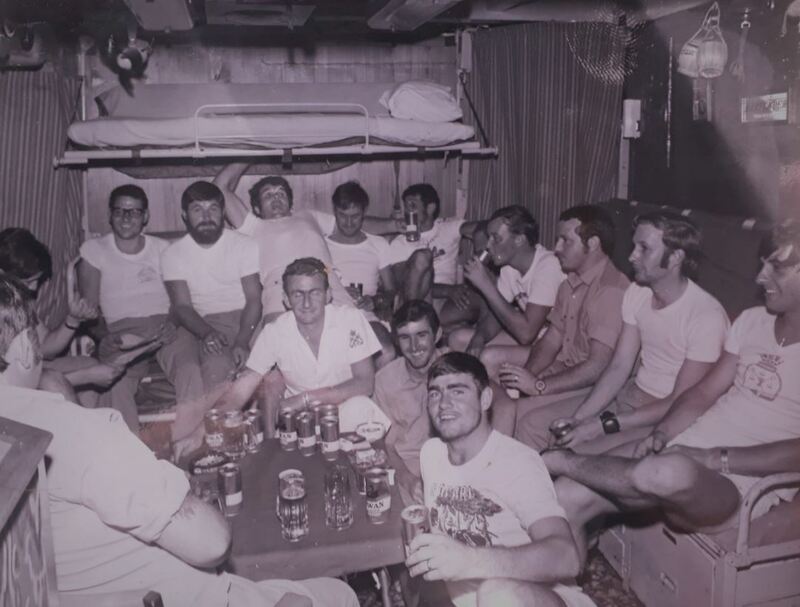 I think sitting on the rear bunk 2nd from left maybe Jim Bettridge. It appears that the PO in the middle could be Brian Anderson (Andy) RIP..
maiden voyage from UK to NZ. I was living in Singas at the time. This photo would have been taken after 1976 as Marty was a killick on Otago that year. …and the S/Rs are still wearing khakis. The pic must be between 1976 and 1980. Jim Bettridge was also a killick on Otago in 76. This gentleman looks a bit fuller in the face than Jim. Def not me as I did not have the privilage to serve on the mighty Canterbury, not sure who the PO is? Marty Evans 1976/1977. i joined prior to sailing for UK. CY went into refit 1978. I recall Marty left pussers not long after. Dan Warrington replaced me.